Those of you who often fall asleep at the office or lecture hall might just use your hand as a pillow, only to find that you are rudely awakened simply because your hand has become numb. 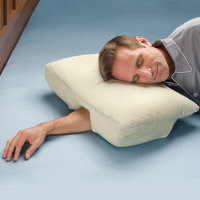 Of course, this applies to those who sleep with their arm under their heads at night as well, making the Arm Sleeper’s Pillow the perfect tool to have. It features a center groove and a recessed front edge which allows you to fully extend your arm without it having to support the weight of your head and neck. This results in a comfortable lying down position, without causing any muscle stiffness the next day. The price to pay for good health and a great night’s sleep? $99.95.